(Nanowerk News) Large facilities like big box stores or hospitals could keep the lights on by using a fuel cell that runs off the natural gas that already flows in pipelines below most city streets. Instead of drawing electricity from the power grid, facilities could use natural gas-powered solid oxide fuel cells to lower their electric costs, increase power reliability, reduce greenhouse gas emissions, and maybe even offset costs by selling excess fuel cell-generated power back to the power grid. Such an energy future could be possible -- assuming fuel cell lifespans are improved and enough systems are produced to reach economies of scale -- according to a cost-benefit analysis published in the journal Fuel Cells ("The Case for Natural Gas Fueled Solid Oxide Fuel Cell Power Systems for Distributed Generation"). If such advances are made, researchers at the Department of Energy's Pacific Northwest National Laboratory conclude natural gas solid oxide fuel cells could play a significant role in meeting future energy demand. The technology could help meet the 10 percent increase in electricity the nation will need in the next decade. That estimate, by the U.S. Energy Information Administration, will require 68 gigawatts more generating capacity. 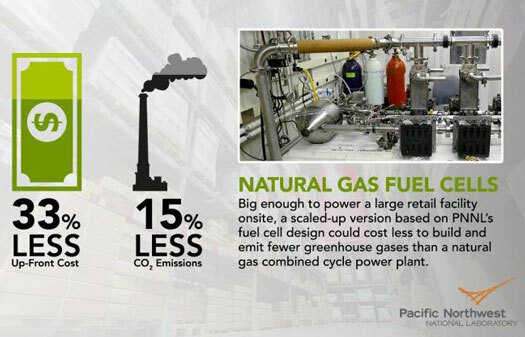 PNNL's study focused on distributed generation, where fuel cells are located right at the individual facilities they power. This is different than the traditional central generation approach to energy, where large power plants are often located far away from end users. Instead of burning fuel like combustion engines, solid oxide fuel cells oxidize it electrochemically. Each cell is made of ceramic materials, which form three layers - an anode, a cathode and a solid electrolyte, much like a battery. Multiple cells must be assembled into a fuel cell stack to achieve the desired power output. Solid oxide fuel cells are inherently highly efficient in converting fossil fuels to electrical energy and PNNL's unique system design, which includes anode recycling, steam reforming, and pressurization, advances the technology even further. "On the anode side of the fuel cell, we recycle waste heat in a steam reformer to squeeze even more energy out of the fuel - about 25 percent more chemical energy compared to typical solid oxide fuel systems," said Larry Chick a materials engineer at PNNL. "The stack operates under high pressure - about the equivalent of being 230 feet under water. That increases the power density, which reduces the size of the stack by about 60 percent and lowers the fuel cell's overall cost significantly." The researchers based their cost modeling study on a small-scale solid oxide fuel cell system designed, built, and tested at PNNL and a larger conceptual system of 270 kilowatts, which is enough to power a large retail facility or light industry. Cost estimates are expressed in 2012 dollars. The study showed that for the same power output, a natural gas fuel cell would cost almost one-third less to build than a centralized natural gas combined cycle plant. "We were intentionally conservative as we calculated the cost of both building and operating natural gas solid oxide fuel cells and other types of generation," said PNNL economist Mark Weimar. "For instance, in comparing the solid oxide fuel cell to a 400 megawatt natural gas combined cycle plant, we assumed that the larger, central generation plant would pay cheaper wholesale prices for natural gas compared to smaller, distributed generation fuel cells, which we estimated would pay retail or almost double the wholesale cost." The authors report that if stack life improvements are made and mass manufacturing is achieved, natural gas solid oxide fuel cells can be cost-competitive with natural gas combined cycle plants, which are projected to generate electricity at a total cost of 6.5 cents per KWh. They calculated natural gas fuel cells would have a total electricity cost of 8.2 cents per kWh. When researchers factored in the additional benefits of distributed generation, it brought the cost down to 5.3 cents per kWh. Those benefits stem from the fact that fuel cells don't have the extra costs and power losses associated with transmission and distribution power lines that central power plants experience. The high efficiency of natural gas fuel cells means fewer greenhouse gas emissions as well. The PNNL prototype showed 56 percent electrical conversion efficiency compared to 32 percent from conventional coal plants and 53 percent from natural gas combined cycle plants. The study shows that the natural gas fuel cell system would produce 15 percent less carbon dioxide per kWh than a modern natural gas combined cycle power plant. Additionally, since a distributed generation natural gas fuel cell system would be installed on site, some of the heat from the fuel cell could be used to heat water or interior spaces. If just 20 percent of the fuel cell heat replaced the use of grid electricity for heating, then the fuel cell system would produce 22 percent less carbon dioxide than large-scale natural gas combined cycle plants tied to the grid. Currently, fuel cell stacks last only about two years. Over time, as the fuel and oxygen are constantly being pumped in and run over the catalyst in the cells, the chemicals start to degrade and the system starts to wear down. The study noted fuel cell stacks would need to last six to eight years to be competitive, and uses a15-year lifespan in the study's cost comparison table. With additional research, the limited stack life can be overcome," Chick said. "It's a matter of conducting reliability testing on integrated systems and using advanced characterization techniques to figure out what is degrading the performance of the stacks over time. The Department of Energy's Solid Oxide Fuel Cell program has been achieving targeted improvements over the last decade, so things are moving in the right direction."